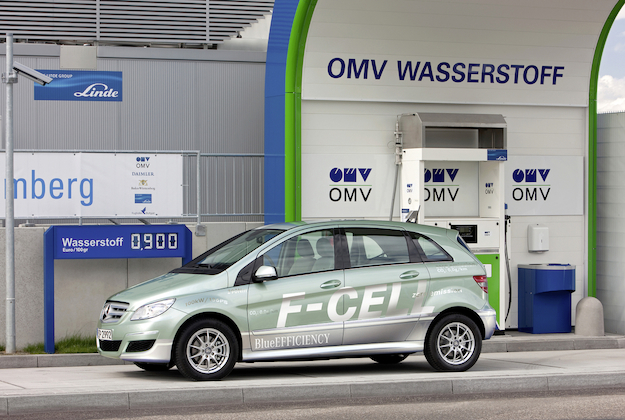 Late last week we reported that Mercedes-Benz had put a hold on its hydrogen fuel-cell vehicle, the F-Cell, until at least 2017 while it sought out partnering automakers. We had mused that perhaps a Renault/Nissan partnership would be beneficial as the automakers are currently in a technology sharing agreement. News has now come from Ford that Daimler (Mercedes-Benz), Renault/Nissan, and Ford have all teamed up to produce a fuel-cell electric vehicle for 2017. Our smug sense of validation was fleeting as a greater confusion set in. For years, automakers have had a bit of an obsession with hydrogen-powered vehicles in spite hydrogen fuel-cell vehicles being hugely unrealistic. As we pointed out last week, hydrogen production is immensely energy intensive. Additionally, the hydrogen fueling infrastructure is also miniscule in comparison with gasoline and even natural gas. We always figured automakers enjoyed making a big public relations show of their hydrogen fuel-cell vehicles because they made for good press, even if many knew these vehicles were unrealistic. If the public thinks an automaker is deeply invested in a wonder technology like hydrogen, which only produces water vapor from the tailpipe, that automaker would seem like it was trying to make a substantive change in the way our vehicles impact the environment. For many years, this sort of public image was worth its weight in gold. However, now that EVs, plug-in hybrids, and even air hybrids – like we saw from Peugeot – have become commonplace, we wrongfully assumed automakers had given up on the hydrogen boondoggle. Now Ford, Mercedes, Renault, Nissan want to make a hydrogen/electric hybrid for 2017. This seems great. If you don’t mind, we’re going to withhold our applause until we actually see the product of this partnership and hear how the four have worked out the cost and looming infrastructure issues. As it stands, the four auto giants will have to overcome virtually impassable obstacles standing between hydrogen as a mass-consumable energy source and the public. What happens if you unlock your smartphone now that it's illegal?